Today's card is a super simple card that I think I'm going to use as a Valentine for my sweetie. What a sweet little card, I love the dies you used to. The paper is too cute. Thanks for another wonderful project, I so look forward to them. You always make it look so easy! Thank you for sharing your beautiful and simple Valentine card. Love that paper collection! Thanks for all the time you take to make these videos for us. Love the My Mind's Eye paper collection. It's so nice to see a bit of a different Valentine's card that's not so pink as most of them are. Great job! I like the simple little cards. It shows me I don't have to work all day to try to create something. All I have to do is layer the right papers together with a little design to them and the right stamp and you have a great card. Thanks again for all the inspiration. I just love all the pretty papers you choose. Wish I had a cuttlebug but then I would have even more things to store. 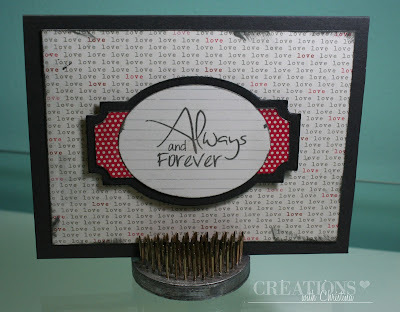 I have the sizzex boutique embosser and love that but it does not cut.